Five men holding cardboard signs huddled together, urging passersby to join them in protest against financial institutions. A month earlier, they had been among hundreds of others camped out in New York City’s Zuccotti Park. But on this biting cold post-Christmas day, they were the only ones who had ventured through the maze of metal fencing and past security guards to continue a vigil against corporate greed and social inequality. The sight of the barricade snaking around the park’s perimeter chilled me as much as the winter air. Up until then, I only had read about the various Occupy Wall Street demonstrations and encampments around the country. The movement didn’t have much traction in my rural, island community. Although many here share the concerns of the Occupy participants, we’re insulated from much of the evidence of corporate influence—our bank is locally owned, there are no corporate headquarters or business chains here, and generosity predominates over greed. When Occupy Wall Street hit the news on September 17, 2011, I was immersed in my return to work as a school nurse and the first semester of my MFA in writing program. A couple of weeks later, when protesters closer to home organized Occupy Seattle, I gave the movement limited attention. As much as I wanted to believe in the power of the people, I doubted that even thousands of rallies around the world could reverse the inequities caused by what is now characterized as “the 1%” – the wealthy few who control the banks, the mortgage industry, and the insurance industry. 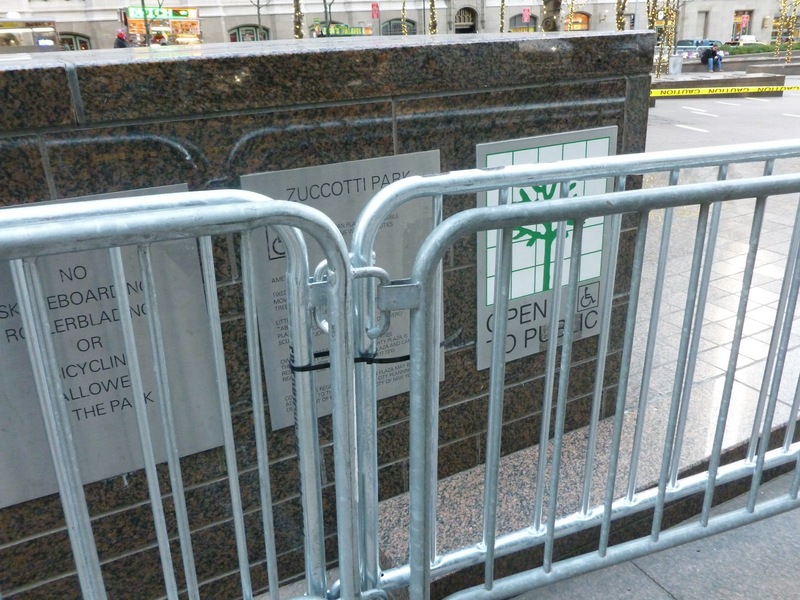 When I saw the fence hiding the entrance to Zuccotti Park that December day, I despaired anew for the powerlessness of the 99%. This “open space” was a logical site for the first encampment of Occupy Wall Street because of its location in the financial district of lower Manhattan. In 1968, developers of One Liberty Plaza were permitted to add 500,000 square feet to their building in return for providing a public space. Ironically, the 33,000 square foot park was named Liberty Plaza Park. After renovations in 2006, it was renamed by its current owners, Brookfield Office Properties, after company chairman John Zuccotti. The barricades came down in Zuccotti Park on January 10, the day after lawyers from the New York Civil Liberties Union sent a letter to the New York City Buildings Department citing zoning laws that require Brookfield Properties to provide unobstructed access to the park. VillageVoice.com reported that within an hour of the removal of the barriers, protesters had returned. We Quakers claim to “speak truth to power.” Early Friends such as George Fox, William Penn, and John Woolman raised their voices in protest, often against impossible odds and in direct opposition to those in power. Noah Baker Merrill of Putney (Vt.) Meeting writes in the January 2012 issue of Friends Journal about the Occupy movement as a current-day example of witnessing to those in power. Although I’m far away from these scenes, my heart is with those who are keeping concerns about economic justice before us. Until now, my voice has been quiet about the issues brought forth by the Occupy movement. I’m not clear how I’m to speak for these concerns, but I’m “open” to adding my writing voice to the protest.